NTERNET TELEPHONY® magazine recognizes Patton’s SmartNode 5400 Enterprise Session Border Router with integrated four-wire G.SHDLS.bis interface for outstanding innovation. GAITHERSBURG, MD and BERN: PATTON (USA) and PATTON-INALP (Switzerland) announced today that the SmartNode 5400 Enterprise Session Border Router Enterprise (ESBR) with integrated 11.38 Mbps four-wire G.SHDLS.bis WAN interface has won the INTERNET TELEPHONY 2011 Product of the Year award, maintaining a seven-year winning streak for the VoIP-equipment brand. The Patton’s SmartNode SN5400/2GS offers service providers and enterprises a one-box CPE solution for faster, lower-cost implementation of SIP-trunking solutions. Patton reduces capital equipment expenses by eliminating the external broadband modem requirement: the SN5400/2GS comes with an integrated high-speed ITU G.991.2 WAN-access port that delivers speeds up to 11.38 Mbps over dual copper twisted pairs. 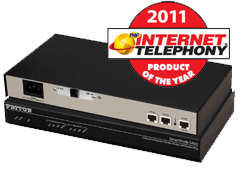 Protocol Mediation: Swiss-engineered and US-manufactured, Patton’s powerful session border controller delivers secure connectivity between iPBX phone systems and Internet Telephony Service Provider (ITSPs) while providing any-to-any protocol mediation for SIP and H.323 voice—plus G.711 and T.38 FAX. WAN Optimization: By transcoding all industry-standard voice CODECs, the SN5400 optimizes WAN utilization while ensuring toll-quality voice over the corporate LAN. Such WAN optimization accelerates performance of WAN applications throughout the enterprise, including file downloads, video-conferencing, and cloud-based services. I am happy to grant Patton our INTERNET TELEPHONY® Product-of-the-Year award, Our editors confirm Patton’s SN5400/2GS addresses real needs in the SIP-trunking and unified-communication markets. We congratulate the entire team at Patton for delivering high quality, reliability and innovation while advancing IP communication technologies year after year after year. stated Rich Tehrani, CEO, TMC.